I have very fond memories of watching Quantum Leap when it first aired in the UK. I was barely in double figures by the time the show ended but I remember sitting down with the family, sticking BBC Two on and excitedly watching every single episode. Originally airing between 1989 and 1993, Quantum Leap acquired a devoted following and 25 years after it finished, the show remains a pop culture phenomenon. Fans of the series were delighted when a Blu-ray boxset was announced and now it’s finally here so you can relive the entire series. 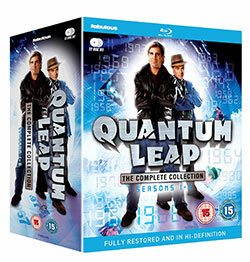 Quantum Leap is already available in individual seasons or as a complete boxset but until now that was only DVD. The Blu-ray release marks the first-time fans can own the series complete with all of the original music, something the DVD release didn’t have. Spread across 22 discs, the boxset includes all 97 episodes of the show and its Blu-ray transfer is impressive. The show was originally broadcast in 4:3 so the aspect ratio has been retained but the picture quality has scrubbed up very well indeed. The special effects look a bit wobbly and dated, as you’d expect from a show made in this period, but the stories and the episodes hold up remarkably well. As you may recall Quantum Leap follows Dr. Sam Beckett (Scott Bakula), a physicist who finds himself trapped leaping through spacetime. He’s accompanied by his holographic guide Al (Dean Stockwell) and each week saw him leap into another person’s life in a different time. Rather unusually, or at least by modern TV standards, Quantum Leap never really established season arcs meaning that the show is accessible to pretty much everyone. You don’t need to know what happened before any episode really to enjoy it. Each story is self-contained and that makes it quite a rare and remarkable show. Quantum Leap was incredibly forward-thinking for its time and many of the issues the series tackled over its five seasons remain relevant today. Scott Bakula was perfectly cast as the charming Sam and he gave a truly fantastic performance. Every episode required him to take on wildly differing characters and as an actor, he got to show his range in a way that many don’t. Whether he was playing a man, a woman or a person of a different ethnicity, Bakula always nailed the role. He was of course aided by Dean Stockwell as Al who provided comic relief and plenty of entertainment. The two actors had a great on-screen chemistry and it’s that, that kept people tuning in every week. The extras on the boxset are a little lacking but Bakula and Stockwell share stories about the show with creator Don Bellisario in the featurette A Kiss With History and there are a handful of episode introductions from Bakula too along with the star discussing the show’s ardent fans. If you’ve never seen Quantum Leap or you’d like to revisit the much-loved series, this Blu-ray boxset really is worth your time. If you have the DVDs already there’s not a whole lot more to offer aside from the original music and enhanced picture quality but for me that alone makes it well worthwhile. Quantum Leap is a show that has stood the test of time and speculation is rife that a big screen follow-up to the series could be heading our way very soon. Take my advice and give the show another watch so you’re ready for the potential big screen outing!